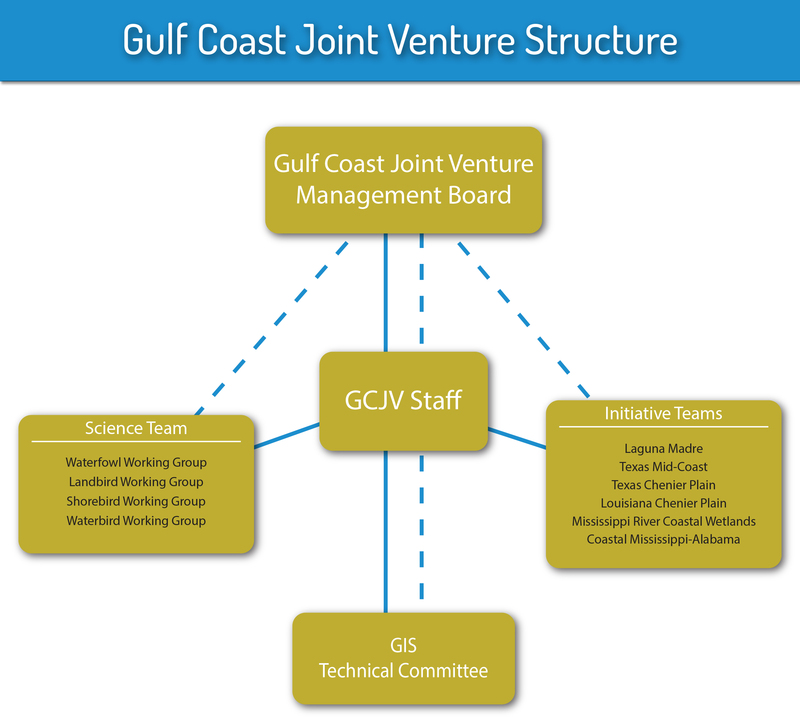 What is the Gulf Coast Joint Venture? The Gulf Coast Joint Venture (GCJV) is a partnership among Federal and State Agencies, non-profit organizations, and private landowners dedicated to the conservation of priority bird habitat along the U.S. Gulf of Mexico coast. Habitat projects are developed and implemented by 5 regional Initiative Teams of biologists and managers of public and private lands. GCJV partners include numerous other organizations and hundreds of individuals that are involved in specific collaborative habitat, planning or evaluation projects. GCJV office staff coordinates priority bird conservation planning, delivery, and evaluation for the partnership. The GCJV office is located in the U.S. Geological Survey National Wetlands Research Center, Lafayette, Louisiana. The GCJV region includes the coastal portions of Alabama, Mississippi, Louisiana, and Texas, as shown in the map below. The GCJV has its roots in the North American Waterfowl Management Plan (NAWMP) , an international agreement signed by the United States and Canada in 1986, with Mexico signing in 1994. The NAWMP focused on the conservation of waterfowl and wetlands, in response to declining continental populations. The NAWMP established population objectives for waterfowl and a conservation framework of regional "joint ventures" to guide the restoration, enhancement, and protection of waterfowl habitat. Continental and U.S plans have been developed for other bird groups. These include the Partners in Flight North American Landbird Conservation Plan, U.S. Shorebird Conservation Plan, and the North American Waterbird Conservation Plan. The Joint Ventures, with their experience in planning, designing, and implementing waterfowl conservation under the NAWMP, were well positioned to deliver conservation for these other bird groups. Consequently, in 2004 the GCJV broadened its conservation efforts to include landbird, shorebird, and waterbird conservation planning, in addition to waterfowl. The figure below illustrates the structure of the GCJV partnership. The partnership is composed of a Management Board; Monitoring, Evaluation, and Research Teams (MERT); Initiative Area Teams; GIS Technical Committee; and the GCJV Staff located in Lafayette, LA. Other partners engage in conservation planning, research, monitoring, and/or habitat delivery activities on a project-specific basis. The GCJV is guided by a Management Board, composed of representatives from each of the formal partners. This Management Board provides broad oversight and guidance for all aspects of the partnership, including establishment of conservation goals, maintenance of support necessary to achieve the goals, and determining policy. GCJV Staff serve as Chairpersons for each MERT Working Group and the GIS Technical Committee. GCJV Staff also serve as advisors to the Initiative Teams, primarily assisting in communicating GCJV objectives and priorities, identifying potential projects that contribute to those objectives and priorities, and identifying sources of funding necessary to move projects toward completion. The GCJV is one of 18 U.S. Joint Ventures, in addition to 4 Canadian Joint Ventures, and 3 species-based Joint Ventures. A thorough definition of Joint Ventures and a directory listing all of the Joint Ventures in the U.S., Canada, and Mexico can be found here. The map below shows the boundaries of the U.S. Habitat Joint Ventures. Clicking on a Joint Venture will take you to its website in a new window or tab.